Well, my two months traveling across the Silk Road on the “mechanical camel” has come to an end. This was essentially MAdventure’s Central Asia Budget Adventure trip and, once I’d come to terms with the speed of travel (much faster than I normally move), I really, really enjoyed it! However, it is not for everyone, and it really is “budget” in every way. The truck is not air-conditioned or heated. And you must take your turn with cooking and cleaning. You should not expect even basic luxuries on this trip, and it makes them all the sweeter when they do miraculously occur! It is also not for you if you get bored easily and are unable to entertain yourself in the back of a truck for long periods of time. And if you have an over-inflated sense of self-importance, please, do yourself and your potential fellow travelers a favour and choose a different trip! Bloody hot (she says with a beetroot-coloured face)! Women at both extremes – those who cover up completely with a black Chador, and those who flaunt as much as possible the restrictions they are currently placed under (the headscarf is meant to cover all hair). Water fountains everywhere in the cities with drinkable water (at least I didn’t get sick) Awesome idea! Donation boxes along many of the main streets in towns. Love this idea as well! Rice paddies and blackberry bushes in the northwest. Not sure why I was surprised to see rice paddies given rice is a key ingredient in Iranian cuisine. Upright beach shelters used as tents for camping – including on the footpaths and in the parks of towns. There are actually signs to tell people not to do this. People picnicking. Even during Ramadan, groups of Iranians would spread out their blankets under a tree and picnic … with no food. Trucks! Soooooo many trucks (unfortunately I didn’t manage to get an illustrative photo)! I thought we had a truck problem in Australia on our roads, but the numbers of trucks travelling the roads in Iran is truly staggering! Fortunately, and unlike Australia, the Iranians have built dual carriageways to allow you to overtake. Motorbikes! Sooooooo many motorbikes! And they go anywhere and everywhere, including everywhere that pedestrians are trying to walk. Watch out! One of the key considerations when heading to Iran is the strictly enforced dress code in place there. By law (not just for religious reasons), men must wear long pants, women must wear long pants/skirts/dresses that cover the ankles, long sleeves (at least ¾ length) and a headscarf that covers their hair. In addition, if a woman is wearing a long-sleeved shirt with either pants or a skirt, their top must be long enough to cover their arse completely. If you do not adhere to these rules, then it is actually possible to be arrested! Having traveled through Yemen (another extremely conservative muslim country) for a month back in 2008, I figured that the clothing I wore there would be suitable for Iran. However, I was advised by our Iranian guide, Mr Ali, that my shirt was probably too short – so one of the first things I did in Iran was try to buy something longer. Our first stop was the small village of Masuleh, which is super-popular with Iranian tourists. Possibly for this reason, it turned out to be incredibly difficult to find normal clothes! I eventually found a man’s shirt that I figured would do – but the young girls who were tending the shop burst into uncontrollable fits of giggles over this and essentially refused to sell it to me because it wasn’t for women. Giving up on them, I eventually managed to find one stall selling non-touristy clothing, and a fellow traveler and I enlisted the assistance of a very fashionable Iranian woman who spoke great English to help us with what was appropriate. What ensued was much hilarity! The longest item of clothing he had was – I swear to God – a 1950s vintage granny dress, complete with gaudy and elaborate lace detail in the neckline. I took one look and said “you have to be kidding” – but they insisted that I put it on – and then laughed their heads off at me. They were almost rolling around on the ground they were laughing that hard. There was no mirror, so I couldn’t see how bad it looked, but I got them to take a photo of me. I actually don’t think it looked that bad – and I would have bought it if I had to. But fortunately, we found this much nicer number – which I wore and rinsed on each of the days I spent in Iran. It will convert nicely into an “over swimmers” shirt back in Australia  I also learned through this experience that it is quite difficult to try on clothes when you have to keep a headscarf on at the same time! And by the way, yes – James managed to get the truck stuck again 🙂 Fortunately, this time, only for about an hour, but there were tense moments! In the home, of course, Iranian women can take their headscarf off – it is only when they are out in public or there are men who are not part of their family around that they have to wear it. However, because we camped for 3 of our nights in Iran, we were always out in public. By the 3rd night, all of us were so hot and had gotten so sick of it getting in the way when we were trying to set up camp, we all converted them into turbans instead to ensure our hair was covered but to keep them out of the way. Here are all the girls done up in our Iranian gear after our last camp in Iran. When I got on the plane from Tehran to Abu Dhabi, I have to admit it felt very, very liberating to be able to take off the long sleeves and headscarf. Perhaps if it wasn’t obligatory and done solely for religious reasons it wouldn’t have been such a big deal. But I certainly felt the weight was lifted when I no longer had to follow such a strict dress code. And all the women I talked to (and many of the men) my age or younger – they all hate it. This sign on one of the platforms of the Tehran metro pretty much sums it up. If you look closely you can see that someone has drawn a “sad face” on the woman. There is definitely a hope amongst the under-45s at least, that when the old guard “move on”, Iran can revert back to the progressive country it was a few decades ago and leave all this behind. After almost 2 months together, I finally said goodbye to the MAdventure group and headed off on my own – catching the train from Yazd to Tehran. You can’t actually buy train tickets from outside of Iran, yet all the recommendations say to book it in advance, so I was very thankful that I managed to get a ticket, arranged through the hostel we stayed at in Esfahan. Because it was an awesome experience! The train was meant to leave Yazd at 5am but was about 40 minutes late. Not to worry – when I finally got on – I was shown to a women’s compartment that had 6 beds in it (3 high in a bunk arrangement) – the bottom 2 of which could convert into seats. I was provided with sheets and a blanket and, given I’d had very little sleep due to farewells the night before and the early departure of the train, I made up the top bunk and promptly fell asleep for most of the 7-hour trip! The compartment also had curtains, so we could ditch the headscarves for the journey, and they provided us with snacks and water as well! Add in the fact that the train was air-conditioned – it was absolutely heaven! I did spare a thought of my MAdventure companions who were at that moment back in the un-airconditioned truck in the incredible heat overlanding it towards the border with Turkey. Arrived in Tehran and decided to catch the Metro to the hostel. It was incredibly simple to do (Tehran’s Metro is very easy to figure out and very, very cheap) and an interesting experience to be sure! For a start, as I waited on the platform of the station I was yet again confronted with the segregation of men and women in Iran. The front carriage and rear carriage of the train were reserved for women only, with plenty of signs around, and colour-coded seats on the platform making sure that this is clear. The yellow seats indicate the women-only carriages. For the first leg of the journey, I boarded the rear carriage but could see through to the internal barrier that separated the women’s section from the men’s. You can just see the barriers segregating the women-only carriage behind the woman standing under the LED sign. Given I had to change lines 3 times, I eventually figured out that women actually were allowed in the men’s carriages (though men were not allowed in those reserved for women), however, few took up that opportunity. I actually joined a few women in the men’s carriages on the last leg of the journey, and so got to notice the obvious difference between what the “sellers” were offering the passengers. In the women’s carriage, they were selling wool for knitting, kids clothes and hair accessories. In the men’s section, they were offering electronics and super-glue. Not stereotypical at all! The other cool thing about the Tehran metro is how each station is decorated. They are amazing! I only had about a day and a half in Tehran, which turned out to be more than fine. To be honest, Tehran is kind of boring – with very little of interest to visitors. In the end, I couldn’t be arsed walking around in the heat, so I only visited City Park (Park-e Shahr) in the evening (which was close to the hostel and lovely) and explored the Grand Baazar during the next day. All the way along the Silk Road we’d heard small bits and pieces about Zoroastrianism – the ancient religion that dominated Central Asia and Iran before the rise of Islam. Starting around 1,000 – 1,500BC, it was the first religion to posit an omnipotent, invisible God, who asked that followers pray in the direction of light. Given that the only light that could be controlled in those days was fire – this is central to the religion. with its fire that has apparently been burning for over 1524 years (a special Zoroastrian priest adds wood daily). The building also features the winged figure that symbolizes Fravahar, the part of the spirit that reaches the divine being after death. From a copy of an old Lonely Planet that we had on the truck: “The old man symbolizes experience and wisdom, the three layers of feathers on the wings symbolize purity of thought, word, and deed, and the semi-long tail in front represents Vohu Mano (good mind), while the rear tail is Ahem Nano (bad mind).” My souvenir from Iran is actually a pendant with this symbol. The other site we visited was the Zoroastrian Towers of Silence, two large circular structures that rise out of the desert on adjacent hillsides, just outside of town. The Towers of Silence are the two structures on the hillsides in the background of this image. 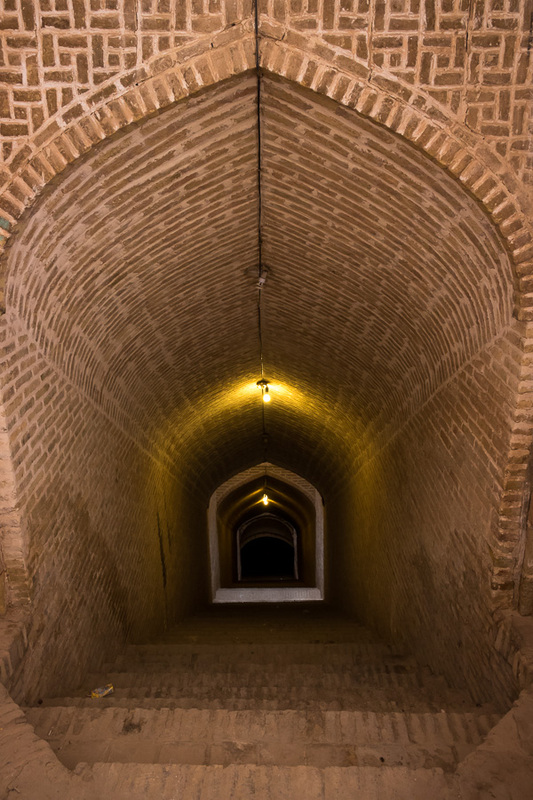 This practice continued in Yazd until the 1960s, with bodies cast into the central pits of the towers. Since then, Zoroastrians have disposed of their dead by burying them in concrete-lined graves. You can visit the site for free if you walk about 300m from the main entrance (the fence literally just stops), and it is a great place to wander around and explore – especially just before sunset. Oh, and you get a great view back over Yazd! I found the Zoroastrian religion a really interesting addition to our exploration of the Silk Road – I had only vaguely heard of it before this trip. My last destination with the MAdventure group was Yazd – a desert town renowned for its well-preserved, mud-brick architecture and fascinating “Badgirs” (wind-catchers). I didn’t think it was possible to get hotter than Esfahan and Persepolis, but I was absolutely wrong. Yazd is something else in the heat stakes – 43 degrees for the duration our stay! Unfortunately, our visit coincided with a public holiday (we seem to have hit several of these in the last 2 months) so there was very little open – including the bazaar where I had intended to go souvenir shopping. Instead, I called into the Jameh Mosque, which apparently has the tallest minarets in all of Iran. and I tried not to intrude too much on these women praying. From there, I went for a choose-your-own-adventure walk through the mud houses of the UNESCO listed Old Town. Around almost every corner, you could spy a badgir – essentially a giant wind catcher used to cool the building. These work in one of 3 ways (read the linked article for more information), the most common of which is where wind enters the tower and is directed downwards. The rate of airflow is what cools the interior, rather than the air itself being actively cooled. My route tended to be dictated by the arches and any undercover sections I could find. I came across several steep stairwells leading underground – I believe these were accesses to to an extensive canal system (unfortunately all were locked and I didn’t have time to visit the Water Museum). And this water reservoir, again cooled by badgirs. The other interesting thing I noted was the door knockers. There were often two of them and apparently which one you use depends on your gender. Different door knockers to let those inside know whether it is a male (left) or female (right) visitor. This stems from the fact that although women must be completely covered up while in public in Iran (it is a law, not just a religious thing), they can wear whatever they like in private and with other females. So when someone knocks at the door – how is the lady of the house to know whether she has to cover up or not? Simple! If it is a male visitor, he uses the knocker shaped like a solid bar which makes a deeper knock. If the visitor is female, she uses the ring-shaped knocker which results in a lighter knock! After walking around for a couple of hours, I went and cooled down in the air-conditioning of the hotel for a while and then headed out to see the biggest badgir of all in Dowlatabad Garden. And while the badgir is impressive, I found the marble baths and stained-glass windows in the building beneath more beautiful. Is it worth the 200,000 Rial (USD$6) entrance fee? In a word – “no” – especially since Iran in general is quite a cheap country to visit. Though the entire complex is meant to be a classic example of Persian desert garden, if that is your interest. Of course, no trip to Yazd would be complete without passing by the Amir Chakhmaq Complex at least half a dozen times. And while I didn’t go in (I’m not sure you can?) its exterior is one of the classic views of Yazd. Although Yazd was interesting and I could have easily spent a few more days there exploring, it did not have as nice a vibe and did not feel as safe as Esfahan – a sentiment shared by several of the women in the group who had issues with the some of the attention directed at them by boys and men. None of us had had this experience in Esfahan. For many people, the highlights of Iran (apart from the people) are the mosques and medrassahs and the blue tiles that adorn such buildings. However, much of this architecture was built after Timur (Tamerlane) cut swathes through the region, and given that he had his capital in Samarkand (Uzbekistan) the most impressive examples are actually found there. What I’m trying to say is that if you have traveled through Uzbekistan, many of the key sights in Iran are a bit “I’ve seen it all before”. Sorry, I know that sounds harsh and is a gross generalization – but that was my feeling after wandering around Esfahan for a few days. So I was really excited to be travelling several hundred kilometres further south to Persepolis – the capital of the Achaemenid (first Persian) Empire (550-330BC – i.e. well before Timur) – for something completely different. We arrived at about 2pm, I slathered on sunscreen, and headed out into the 40-degree heat. I then proceeded to walk around outside for the next 3 hours, turning into a bright red tomato in the process (not sunburn, just hot – remember I’m wearing long pants, long sleeves and a headscarf because I’m a woman in Iran!). But it was totally worth it! This enormous site is amazing, and more reminiscent of what you would expect to see in Greece or Egypt than anything we’ve seen so far across the Silk Road. The complex sits on a raised platform approached by two grand stairways, and consists of several palaces (built by Darius I, Xerxes I and Artaxerxes III), the Gate of all Nations, the Treasury, and various other buildings, all created out of grey limestone. The Gate of All Nations is the top left image, the Treasury is in the top right. A pair of lamassu, bulls with the heads of bearded men, greet you at the Gate of All Nations at the western threshold to reflect the power of the empire. There are columns aplenty, including the decorated stubs of the 72 columns that made up the grand hall of Apadana, the greatest palace at Persepolis. The 13 columns that remain standing show them to have measured 19m high, with each topped by an animal sculpture. But the highlights of the site really are the bas relief carvings that are found absolutely everywhere. As is the Zoroastrian symbol of Fravahar. But the majority of the carvings tell the story of Persepolis, depicting life and the goings-on there. The most well-preserved of these are found on the eastern Apadana stairway (which was only unearthed in the 1930s). I spent ages just sitting exploring the different images of a far distant past. I also hiked up to the three tombs (one unfinished) that sit above the complex and are thought to be the burial sites of Artaxerxes II and Artaxerxes III. Because, you know, you can never get too much sun and heatstroke! I started my Day 2 in Esfahan (see here for Day 1) wandering around the parklands that border the River Zayendeh. Then, after my aborted attempt at visiting the Shah Mosque, I decided that I’d make my way out to the largest mosque in Iran, the Jameh Mosque of Esfahan (the main mosque in each town is called the Jameh Mosque). It is said that this Mosque is a study in Iranian architecture styles and became the template on which almost all other Iranian mosques were built. For this reason, I had hoped they would have an audio tour, but it turns out it was one of the few places that didn’t ☹, though they did have some signs in English as well as in Farsi. Wandering around, my initial impression was that it was very “messy” (there was stuff dumped everywhere it seemed). But if you looked closely, there were beautiful details. The other problem I initially had was I wasn’t sure where I was allowed to go into and where I wasn’t. There were clearly “women’s sections” of the mosque, but did that mean that I, as a tourist, wasn’t allowed to go into where there seemed to be only men? I ummed and ahhed about this for quite a while, until I saw some other women tourists enter the main prayer hall in the South Dome that I’d been dying to see inside. OK – let’s head in! This was an enormous space with a very high domed ceiling and extensions out to either side. To the right, and behind a curtain, was the women’s section. To the left was a much larger section with quite a few men sitting talking, praying or sleeping. It was surprisingly uncomfortable walking through both sections – partially because I still wasn’t 100% sure I was allowed in there, partially because it is a place of prayer and I was a gawking tourist, and partially because the whole segregation thing is very strange to me. But nobody seemed to mind that I was there, they just went on with whatever they were doing. I ended up back under the main dome and laid down on the carpets to relax (like everyone else) and contemplate. Re-emerging outside after about an hour, a couple of men were converting the enormous blank centre of the mosque complex into an outdoor prayer room! This is the large plaza in the centre of the complex, looking towards the South Dome. One of the doors that was locked when I arrived was now open, so I headed in for a look. In the front room was an altar (mehrab) that was very intricately carved, and said to be one of the most exquisite monuments of the Ilkhanid period (13th century; Iran has a long and complicated history). There were also 2 examples of Menbars – step-like constructions on which the leader of the congregation would stand. My visit to this part of the mosque coincided with the appearance of a guide and 2 other tourists, and he invited me to accompany them through a second door into a low, tent-like prayer room that featured “skylights” made of thin marble. I ended up spending a couple of hours out at the mosque (one of which was just lying down under the dome), and then headed back towards the hostel via the enormous covered Gran Bazaar. This winds its way for several kilometres and ends up at Naqsh-e Jahan Square eventually. I didn’t go quite that far, but it was interesting to wander the labyrinth of shops selling everything from clothes to jewelry to toys to spare parts to anything to, well, anything you can possible imagine really. I was so thankful to be able to escape the sun and walk under cover for the majority of the way, even if I had to dodge bicycles and motorcycles, and even a car at one point. I’d already discovered that, in Iran, pedestrian ways were also open to 2-wheeled vehicles! Finished off my time in Esfahan doing what Iranians do – having a picnic. The “young’uns” and I went and bought some cooked chook (seriously the tastiest I’ve ever had!) bread and salad, and had a great time joining with the locals in this most Iranian of endeavours. The reason the above photo is so crap – it was Ramadan and we weren’t allowed to eat in public until well after the sun had set! All in all, I really enjoyed Esfahan – despite the heat!